Hi folks,I think you guyz are bit bored as I always kick my blogs mostly with reviews.So just for a change this time I came with a kind'a of travel blog.As last week end was a long week end(memorial day) I went to big bear lake.So,just want to share my experiences about my trip to all of the viewers.Me with my friends Shyam and Manoj started on Saturday from San Diego to Big Bear city which is a 3 hr drive and 25 miles from city of San Bernardino. Big Bear lake is a hilly place located in San Bernardino county with an altitude of 6752ft.It has a population of 6000.This city is surrounded by San Bernardino National Forest.The roadways to the big bear city are amazing with zigzaggy roads,high mountains with a beautiful view of the scenaries.On my way to the Big Bear,I came across the sign boards saying you are now at Altitude 1000 ft,Altd 2000,altd 3000...altd 6000 which added more excitement to my trip.This place is the first Mountain recreation area in Southern California. 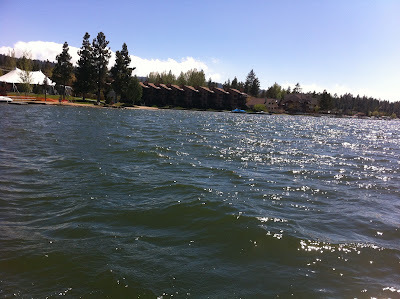 Once you enter the city you will be welcomed by bear kinda of statues and you will see amazing reservoir 'The Big Bear Lake' having the length expanded about 7 miles and 2 miles in width.For the first time in the US I have seen more lodges than motels. Before writing my experiences in the Big Bear lake,let me share you guys the history of Big Bear Lake. So how did Big Bear got it’s name? Big Bear was earlier referred as Yuhaviat (Pine Place) as Serrano Indians Tribe(people of Pine),who are Native Americans lived here long back ago.Benjamin Devis Wilson a American/Mexican statesman and politician was assigned a task to find the Native Americans who stole the ranchers(horses) in yuhaviat ranch places.So on his way with a troop of 22 members ,he came across lot of bears.So he divided all his troop in to 11 pairs for hunting bears,which made them to gather 11 bear pelts and similarly while returning back they gathered 11 more bear pelts and hence he referred this place as Big Bear . Big Bear city was also a gold rush place during 1861-1912 period.William Holcomb while hunting the grizzly bear(A type of brown bear ),he found a quartz(rock)flecked with gold.No sooner the info was leaked by him, the place referred as Holcomb Valley became popular for Gold Rush.This place was famous for boxers in 1990's for trainings. So how the Schedule went? 4-6Pm -Took a power nap in the hotel ,then we went to kinda of adventurous ride in the car in evening.Driving down the hills and in the windy mills area is superb. Dinner time? It's in the Nepali/Indian cuisine The Himalayan Restaurant.Had Nepali food for the first time.Its good especially Nepali special Momo.Thanks to Manoj. (As my friend Manoj is from Nepal, he felt more excited than us...lol)Midnight - Bowling and pool. Lunch Time? Had our lunch in Teddy Bear Restaurant(since 1944 in that place).Food is awesome. we kicked off our trip in the evening with good photo snaps and shopping and finally said bye bye to the Big bear. My first expression after seeing the place is like wow.It’s a natural hot spring place with beautiful scenic mountains and lake.If you capture any scenes with your camera,it can be a desktop background.The pontoon boat ride was amazing.Fishing boat is good for adventurous guys but I felt little bit scary initially but it’s ok later on.Missed the Pirates Boat ride,Mountain biking and the Snow Summit Sky chair ride due to windy on that day.Sunday is amazing day for us as we have experienced all the three seasons on the same day.In the morning it’s so windy having 3 degree centigrade and in afternoon its snowy for 20-25 minutes and then as usual sunny.Even though I missed most of the best attraction rides and sight places,my quench for entertainment satisfied.Its a good place to visit for adventure rides.